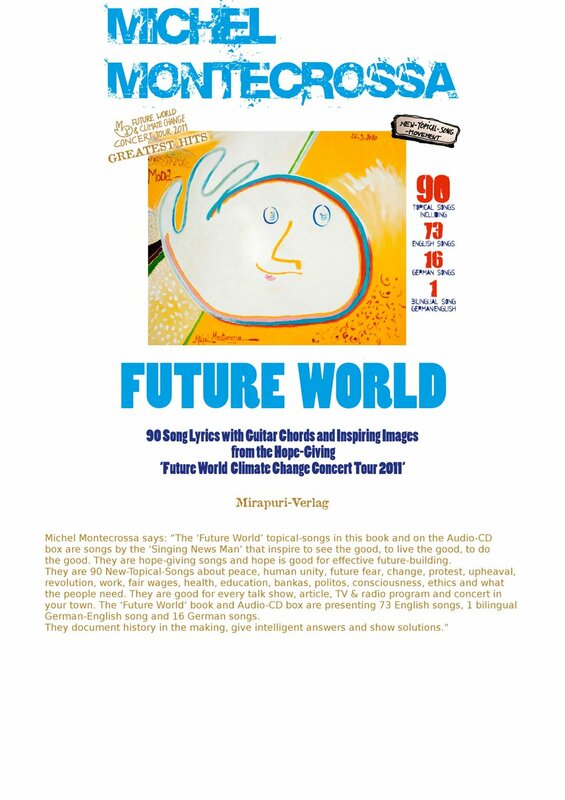 Song & Lyrics Spotlight: read the lyrics & listen to the acoustic New-Topical-Song ‘Absolutely Family’ by Michel Montecrossa taken from his ‘Absolutely Family’ Climate Change Concert that you can read about here and download here from iTunes. Come all ye children, I tell you a tale. Listen closely so you might understand. There are normals and normals and normals, you know. Sometimes there are outlaws and that is good, of course. My family are outlaws, are freedom fighters. We raise our voice, want our rights. but we stand together, are the living goal. The world outside gets darker and darker. Cynicism rising and outrageous corruption. They don‘t believe in anything at all. of true conviction that comes from the light. We aren‘t normal, into future we go. My family are seers, they know what is right. Happy they are and know how to smile. Beyond the darkness is the unknown. I‘m with the good friends that understand. We have the faith, the courage, the hope. We are the outlaws and for that thank the Lord. Imagine people and stories that are attached to them. Help the chances of the world, listen to the voice of change. in the moment at the brink of catastrophe. Independence of ideas, frightened and laughing. Another way of livin’ and thinkin’ mass expression of Green Tomorrow. Underground murmur and the bright light. Dress rehearsal for the freedom nation. Contempt for injustice. Stand for human rights. Voice of the people everywhere. Firm and broad legged, the future’s light. Terrible time of no action. Don’t be asleep but wake up. Show your own solution, things are under water. Deliver improvement. Rise from the ocean. Come in peace and not in violence. Jump-start consciousness change. Overloaded uncertainty leads to hot tension. Pay down all debts. End all the trouble. Being first is your advantage, brings time on your side. With no ideology it’s only economy. Nationalism is rearin’ its heads. “The simple time is the time of finding. What will we find? The simple time is the time of finding. What can we find if there’s no trying? The simple time is not the time of lying. When all is ugly, you are the price. The end is where no one can hide. The way of consciousness: seeing, possessing. From desire to battle to love and oneness. No progress without acting together. The simple time is not the time of denying. The way of consciousness is the way of leadin’. Joy is simple, survival ain’t easy, is the way of believin’. The simple time ain’t the time of cheatin’. Bonus Movie: Preview of Michel Montecrossa’s ‘Simple Time’ Climate Change Concert with New-Topical-Songs dedicated to love, wisdom and unity. do you know what’s a-goin’ on? the world is a-goin’ wrong! too many families know too much pain. The world is goin’ insane! I need solidarity and you need it too. I need your love to make it through. You don’t want to suffer, don’t want to be killed. You want my lovin’, want to feel the place. You know, pretty baby, waterboardin’ ain’t cool. and fingerbreakin’ nowhere is taboo. The call for the better, for the change of all. Nobody can silence the people who are all. The people are we and we want to be free. Governments are thieves, but we defend the real. the clue of love to make it through. We don’t want to suffer, don’t want to be killed. War is not lovin’, makes us ill. I give you my kiss for the way of peace. and nothin’ will go wrong. The people will rise, no horror is endless. We are here for the future, are the future indeed. No more brainwashin’ slavery and poverty. Let us fight and work for tomorrow free! You need solidarity and I need it too. You need my love to make it through. I don’t want to suffer, don’t want to be killed. I want your lovin’, want to feel the peace. ‘In The Light Is The Answer’ is a strong Evolver-Song straight from the heart of a free man pointing into the right direction of love, compassion, life-giving, social justice and peace. This theme is projected in the next song ‘Talking Big Warning’ through face to face, eye to eye, ear to ear lyrics and a tune singing that the operating mode of consciousness must change for ending battles and showing pity, for ending crises and conflicts, for speaking the language of fair sharing. Michel Montecrossa’s uplifting acoustic Evolver-Songs ‘Talking Love & Unity World’ and ‘Thinkin’ About The Future’ make clear that love and unity are good for you and me and are good for the young, the poor and the yet unborn. Life-risk is lurkin’ on the razor‘s edge. when encircled by the system and its devil call. On the razor‘s edge we live, overcomin’ all. We fight the next war of innovation, growth and jobs. Banka-Gangstas are always on the watch. The media is drinkin‘ blood like wine. The truth is hidden, is for outlaws and that is fine. Weather problems rise, harvest is shrinkin‘. All the planet cries and so do my children. My wife is in the kitchen, food-prices go up. ‘La Nina‘ rainfall impacts with plagues, is brutal shock. Life-risk is waitin‘ on the razor‘s edge. No president ever joined the war of the brave. Mothers and fathers weep for their son. He has the honour to never come home. How long are we idiots of the few? Lose our home and hope to the greedy few? Justice means to share and not to steal. Justice means something but not overkill. The anarchy of love is the key to the riddle. Performance and efficiency there is everything. In love we can unite and claim back our dream. On the razor‘s edge I learned all these things. Hey man! Lost your way? Relaxed your dynamics? constructive anarchy of action philosophy. The old Reich lost its center and orientation. only strangers, lost love and broken business. There‘s no way back. Begin with love, don‘t end with a gun. Think and laugh, have a debate on greed. are the new economic targets for new conflicts. Politics as it was has no future, is no future. The United States of Planet Earth are future. to set the people free. the spirit of humanity, cooperation and harmony. culture, economy, ecology and education. the United States of Planet Earth, strong and free. near drowning and breaking of fingers. overcome rulers and demand their total right to live. Let‘s talk about the right way, let‘s come together. Let‘s overcome barriers, prejudice and warfare. Let‘s pay attention and listen to the young. they need the right way.